I'll admit it. I'm a big time lurker on Laura Mae's blog, Lilacs and Lace. I'm never, in a million years, going to be making a beaded gala ball gown, but I love watching her process. Surely, in a prior life, this woman was one of "Les petites mains" in a Paris couture house. My current "Phoney Missoni" is going to need some couture touches, so Laura Mae is the "go to" gal for this couture wannabe. Break out the silk organza! Laura Mae has some excellent tutorials on her blog. I'm always blown away by sewists who are not only incredibly talented, but generous in what they share with the rest of us. 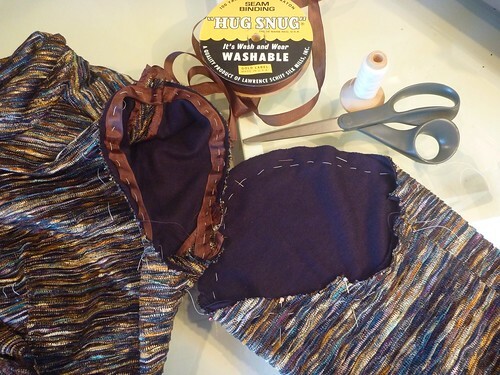 For this project I followed her instructions for making bound buttonholes, and applying Snug Hug seam binding. Both tutorials are crystal clear and easy to follow. I highly recommend them. First up, Bring on the Snug Hug! I actually ordered this roll of Mimi Brown Snug Hug from Amazon. The seller turned out to be A. Feibusch Corp., 27 Allen Street on the lower east side of Manhattan. They've been "zipping the world since 1941", so I've got a new place to explore the next time I get to the city. One roll of Snug Hug and I'm a believer! What can I say about this stuff? It's amazingly light yet stable, adds almost no bulk, is easy to both sew and press, AND you get 100 yards so you can Snug Hug with reckless abandon. So where did I use it? First, I basted a strip along the edge of the lapel to help it keep its shape. (See the top photo). It's so lightweight one would never know it's there. Certainly much more appropriate than the cotton twill tape that's usually used in menswear. 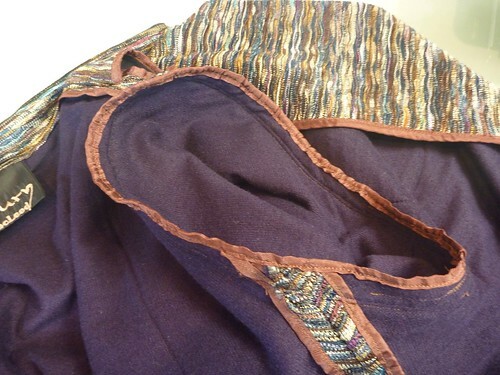 I also inserted a strip along the shoulder seams to prevent them from stretching. I would normally have done this with a piece of leftover lining material. This was much faster, unroll a bit and it's done. 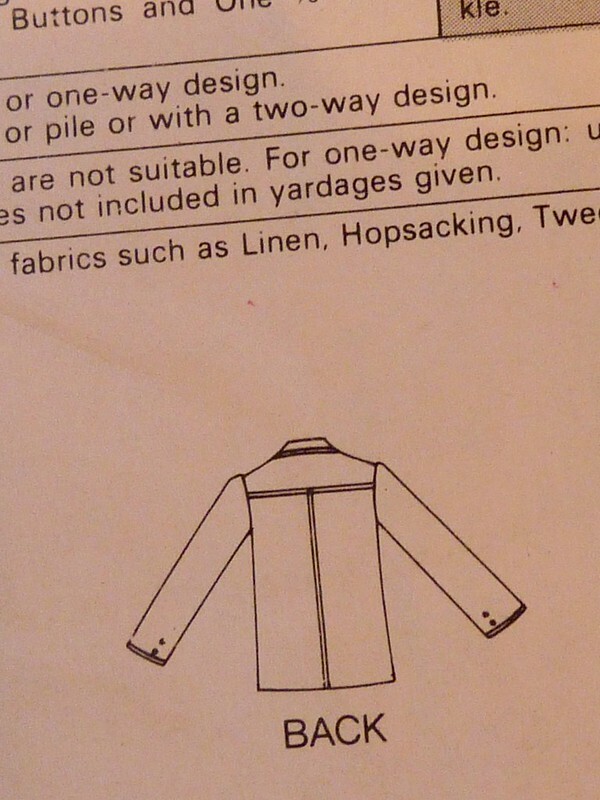 Plus there's nothing to unravel, which is important in an unlined jacket. I sewed a strip into every vertical seam to prevent sagging. When both layers of knit fabric were sandwiched together there was a surprising amount of weight pulling / stretching the jacket down. 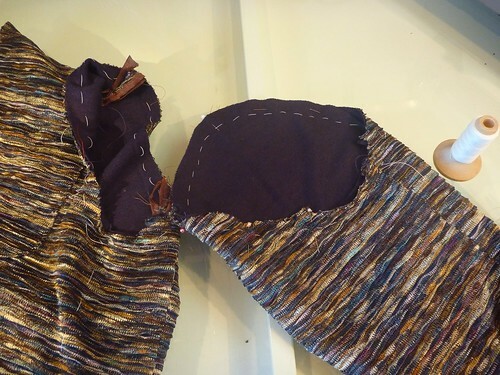 By simply inserting a strip into the seam I was able to stabilize the knit vertically and maintain the shape of the jacket. Again, it added almost no bulk. All the raw edges were finished. Once you get going it's hard to stop, especially when things look this great. What's going on here? I started to reinforce the armscye a la Roberto Cabrera, but changed my mind. 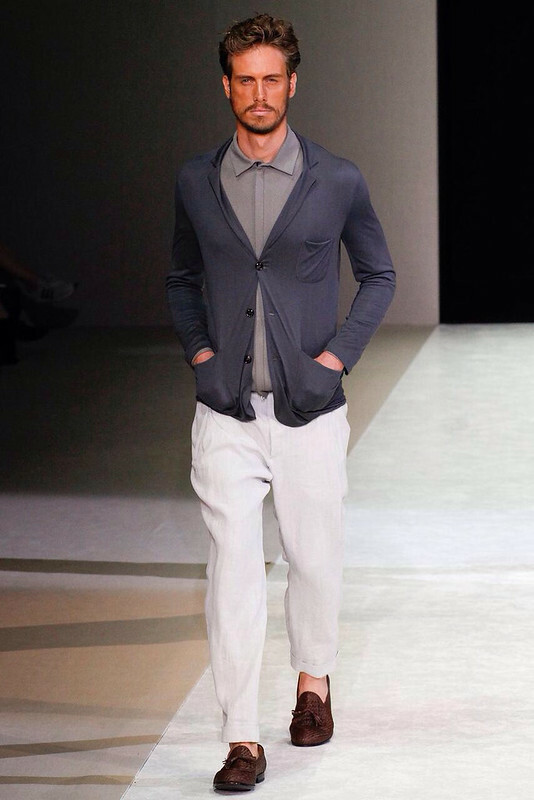 Suddenly things were becoming too structured, and I was losing the "sweaterness" that I was after. Out came this strip. I ended up setting the sleeve and sewing around the armscye twice (three times at the underarm), trimming out the fashion fabric and then binding the lining fabrics together. This was a bit tricky since Snug Hug is only 1/2" wide, but I was able to make it work. First I pressed the Snug Hug in half, and then basted it in place before sewing it on the machine. A little more time consuming, but worth the effort I think. 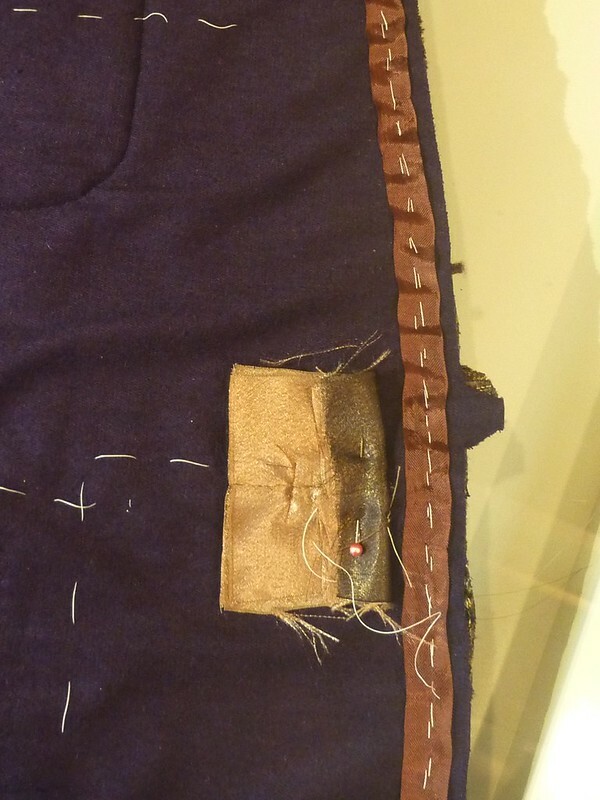 With all the seams snugly hugged, I moved on to the bound buttonhole. Laura Mae's tutorial is well illustrated and easy to follow, so I won't go into all the steps involved. In a nutshell, I placed a square of silk organza on the outside of the jacket and plotted out the position of the buttonhole with basting thread (red). The organza supplies structure that the loosely knit fabric just can't. Without it I think the fabric would just unravel / disintegrate. I wasn't willing to risk a machine made buttonhole on this project. And a bound buttonhole is just WAY more classy! 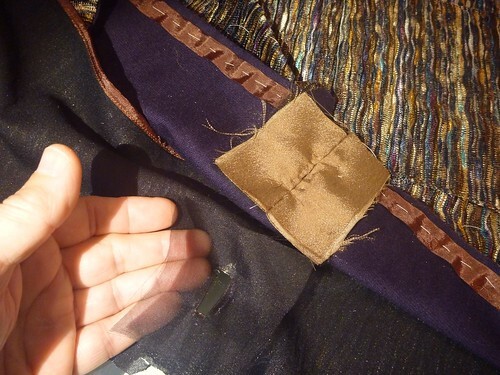 Once the rectangular opening of the buttonhole is sewn, slashed and clipped, it's turned to the inside of the jacket forming a little "window" as you see here. Note: this "window" is actually on the front facing and has been positioned to finish off the back of the buttonhole. 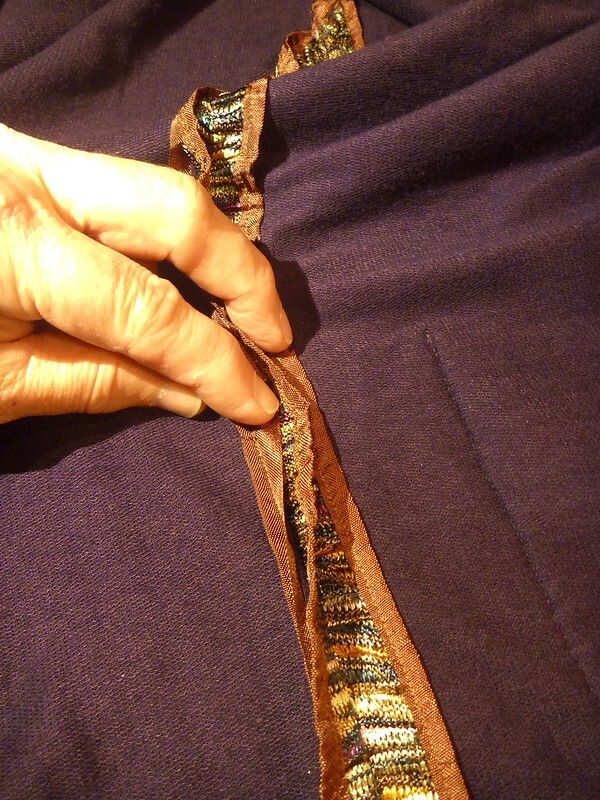 Scraps of lining fabric were used to form the "lips" of the buttonhole. 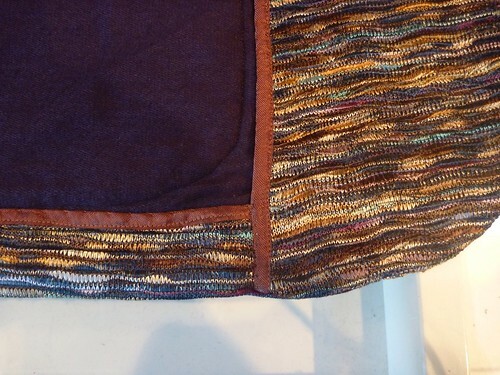 They are handsewn into the window opening, which is surprisingly easy to do. 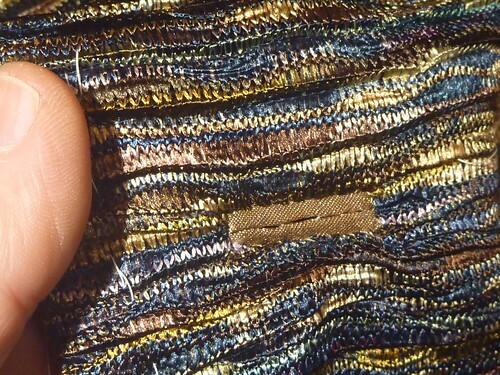 Handsewing gives you complete control over what's happening. Here is the finished buttonhole from the front (it's basted shut until the garment is completed). And here it is from the rear, pinned back so you can see the organza reinforcement. Thanks, Laura Mae, for holding my hand and guiding me through these techniques! I'll never fear a bound buttonhole again. 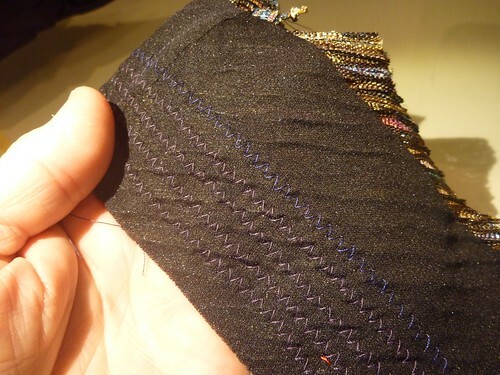 A big takeaway for me has been the similarity of a welt pocket and a bound buttonhole. If you've done one, you've pretty much done the other. The jacket is complete and I've actually worn it a couple of times to rave reviews. I hope to be posting a photo shoot soon. 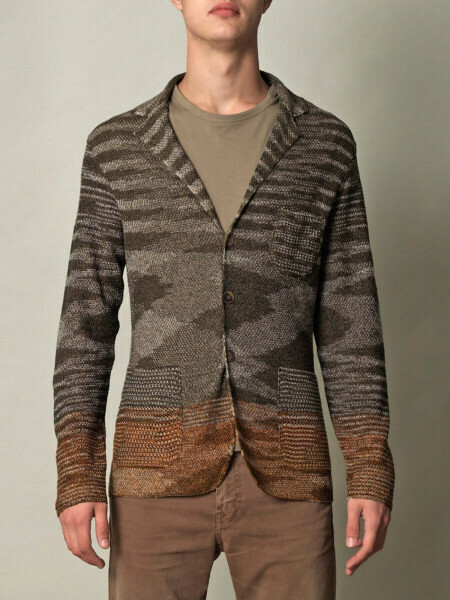 The "Chase Crush" Missoni-esque knit that I've chosen for this project is pretty light weight and VERY stretchy. 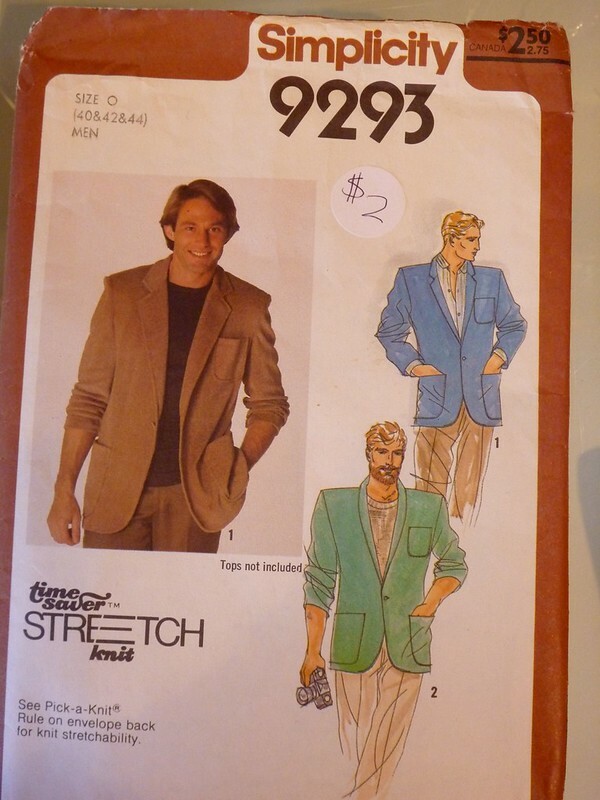 It just doesn't feel substantial enough for a jacket. 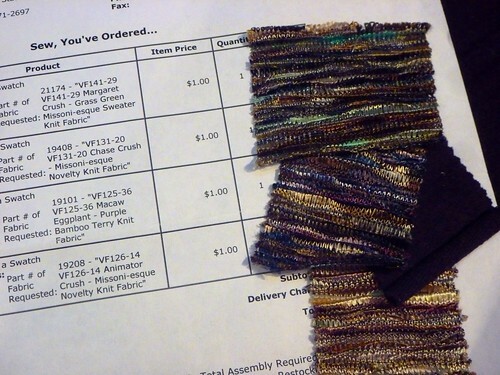 I had also ordered a dark purple bamboo knit from Vogue Fabrics, thinking that I would use it for Thread Theory's new Finlayson Sweater, but it also feels too light. 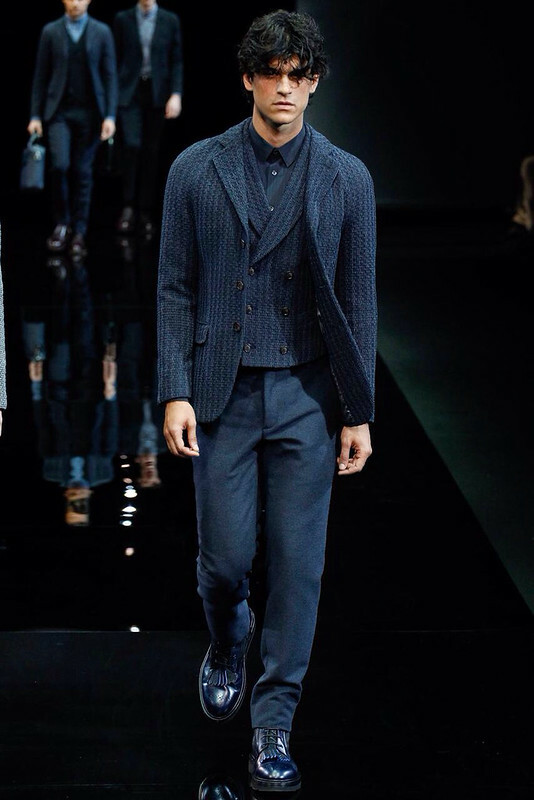 My solution is to combine the two fabrics. Interlining with the bamboo will give me the heft I need. It's also incredibly soft. I wish you could feel this fabric. Soft as any cashmere sweater. I'm a "baste-a-holic" so none of this bothered me. 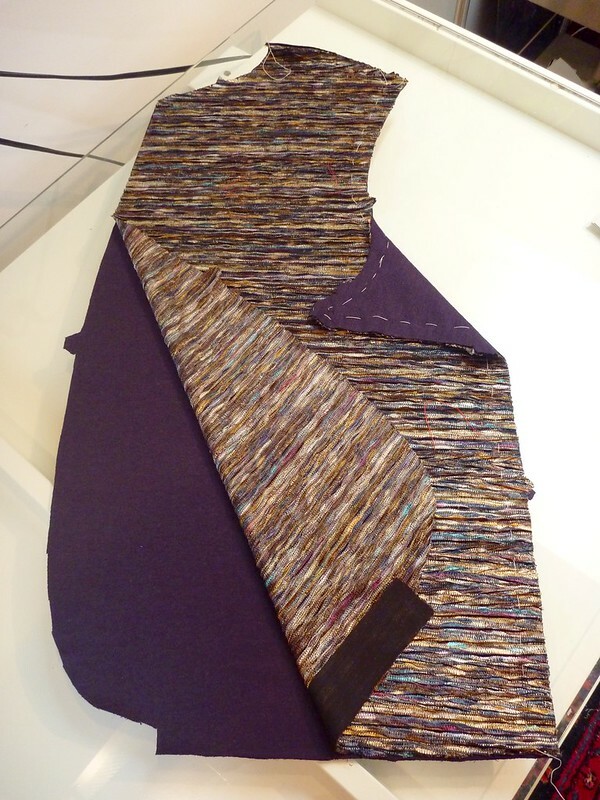 The pattern pieces were cut and then sandwiched together to act as a single layer of fabric. This process went quickly using cotton basting thread. It's amazing how having the right thread can make all the difference. This type of thread is virtually tangle proof, so you just zip along. Highly recommended. I threw in some extra vertical and horizontal lines of basting to keep everything in place. I learned from making my muslin that knits want to roll up after they've been cut. My Missoni-esque fabric is no exception. It's also quite loosely knit and I was worried about its stability. (Probably totally unfounded, but I'm new to knits and they unnerve me!). 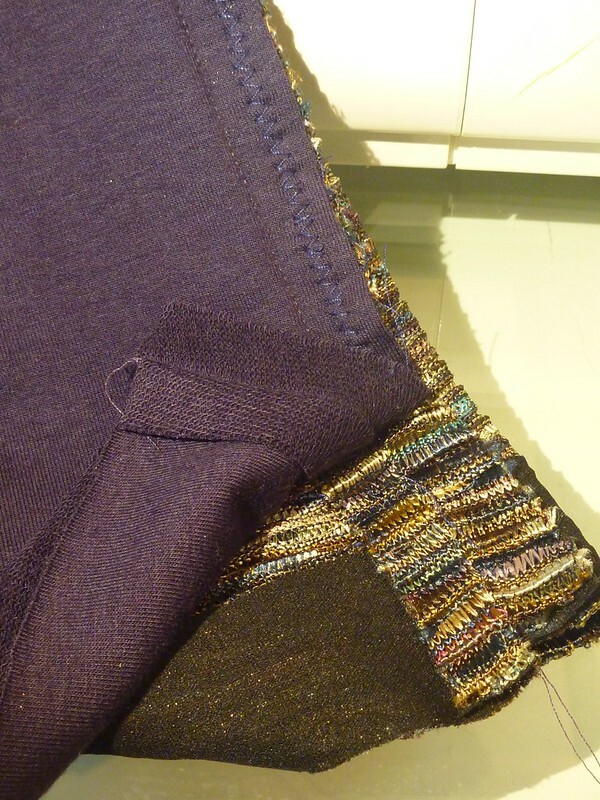 As extra insurance I applied a fusible knit interfacing to the hem of the jacket. This is Pro-Tricot Deluxe Fusible interfacing from Fashion Sewing Supply. 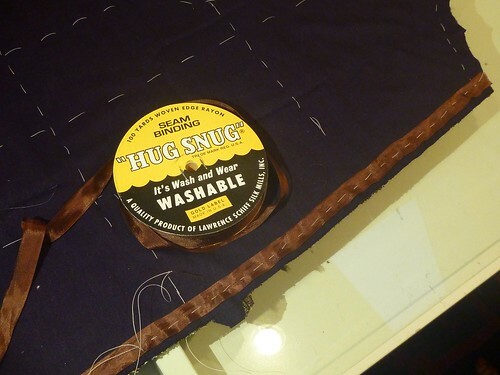 This is a whisper weight stretch fusible, and was SO easy to work with. It fused effortlessly with very slight pressure on a wool steam setting. All my rolling and stabilization issues solved! Maybe I can work with knits after all. The patch pockets were stabilized with interfacing, and then lined with some leftover acetate from my stash of scraps. 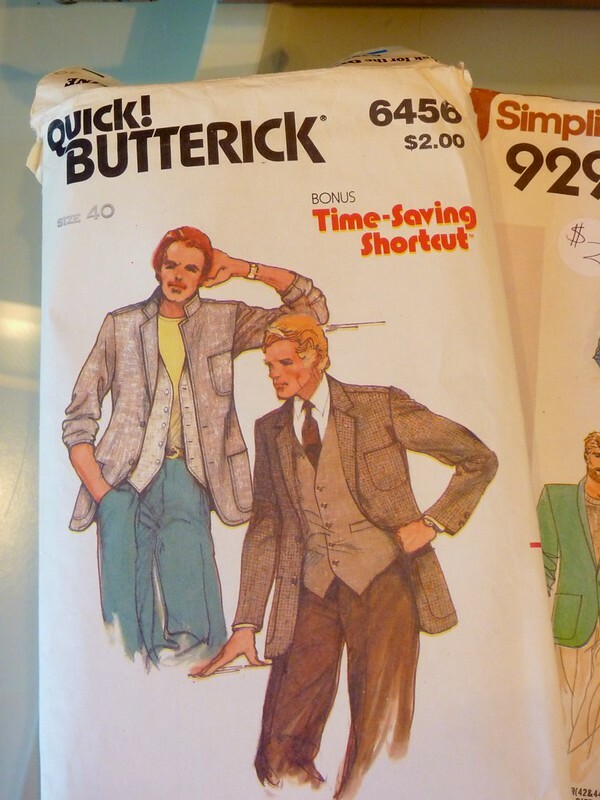 The pattern doesn't include this step, but then again it's a "quick and easy" pattern. I figure if you can make something better, why not take the time. 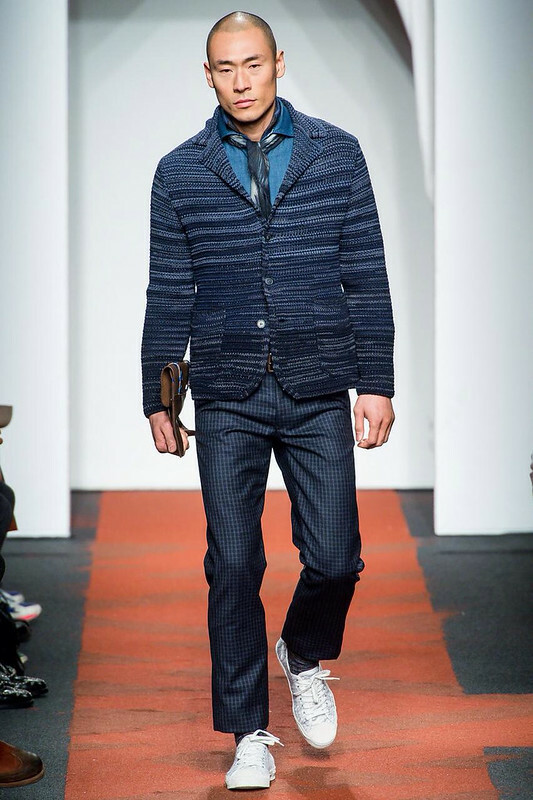 It can sometimes make the difference between a garment you really love to wear, and one that just sits in the closet. All the seams were both basted and pinned before stitching. 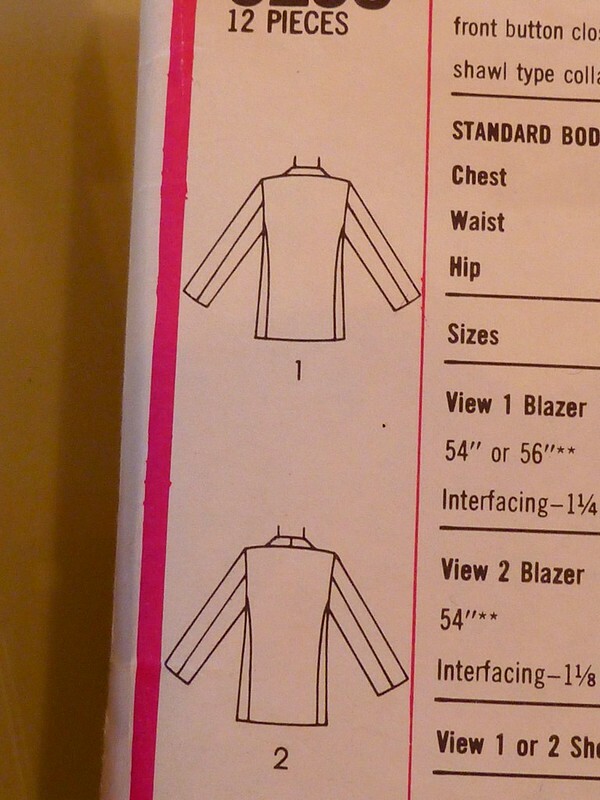 I'm happy to report that I had absolutely no difficulty sewing this on my Singer 301(a no frills straight-stitch). I wanted the sleeves to be lined so that there would be no raw edges to be finished. I used the technique from Roberto Cabrera's book on men's tailoring, (minus all the handstitching!). 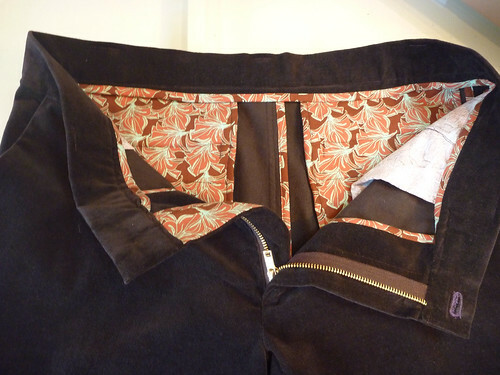 The inside out lining is place on top of the inside out sleeve with the seams aligned. 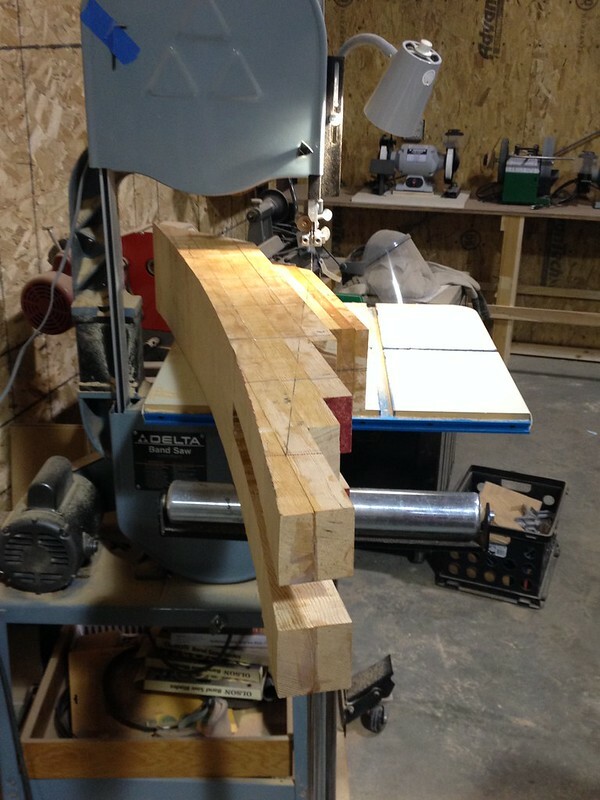 I then zigzagged the seam allowances together so there would be some stretch. (Here you can also see the interfacing appplied to the cuff hem.) 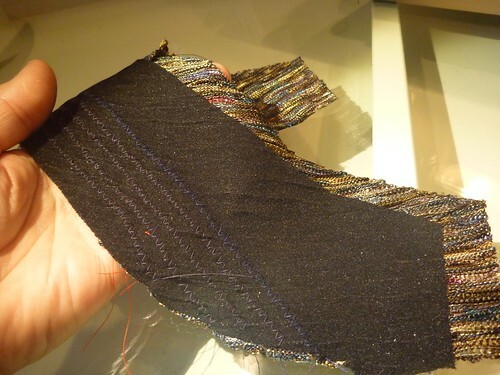 After zigzagging the seam allowances, I reach down through the lining and pull the sleeve up through it. Bam! A perfectly lined sleeve. 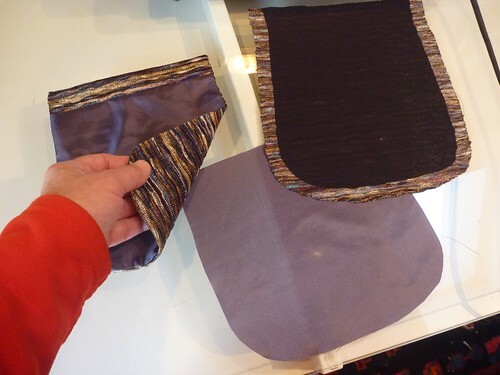 The two layers are then basted together at the top to keep the fabric acting as a single layer. 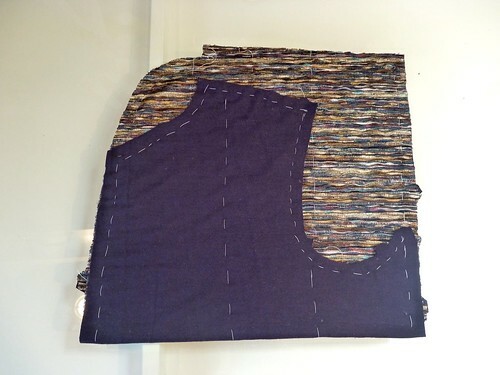 While I had my little Brother zigzag machine out, I added parallel rows of stitching along the roll line of the under collar toward the neckline as suggested in the pattern directions. This helps make a more substantial and stable collar. Things are moving along, and I'm thrilled with my results so far. 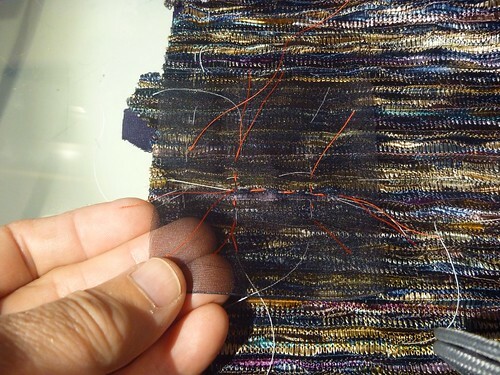 Next up is figuring out how to make a buttonhole in this kind of fabric. I haven't posted anything for well over a month, but it doesn't mean there hasn't been any sewing going on in my world. These two projects, a foulard shirt and a pair of velvet Jeds have been finished for well over two weeks now. The weather just hasn't cooperated for an outdoor photo shoot. Finally, we had a partly sunny day, so I quickly set up the camera and shot these pics in my deer ravaged yard. This is a French viscose foulard from Elliot Berman, my favorite NYC fabric stop. 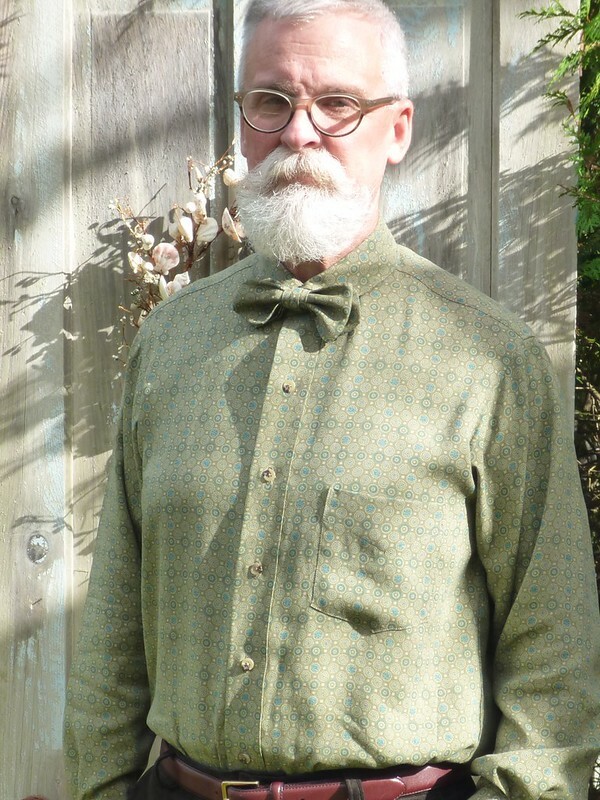 I believe it was almost 60" wide, so I was easily able to get a shirt out of just two yards with plenty to spare. It's a soft olive green with little teal bits, both colors I love and that work well with my expanding "me made" wardrobe. But the real attraction is the positively delicious drape of this fabric. I wish you could feel how hefty, luxurious and fluid it is. That fluidity, however, made for a challenging shirtmaking project. Not that it was difficult to sew.... The challenge was in the matching required for the fronts. There's an underlying grid to the pattern that really requires careful matching both horizontally and vertically. My "cutting table" is a glass topped Ikea desk, and the fabric was slip sliding all over the place. I really couldn't tell what was happening under the pattern pieces. A shirt is a shirt, is a shirt.... So I decided to make a little matching bow tie with the leftover scraps. 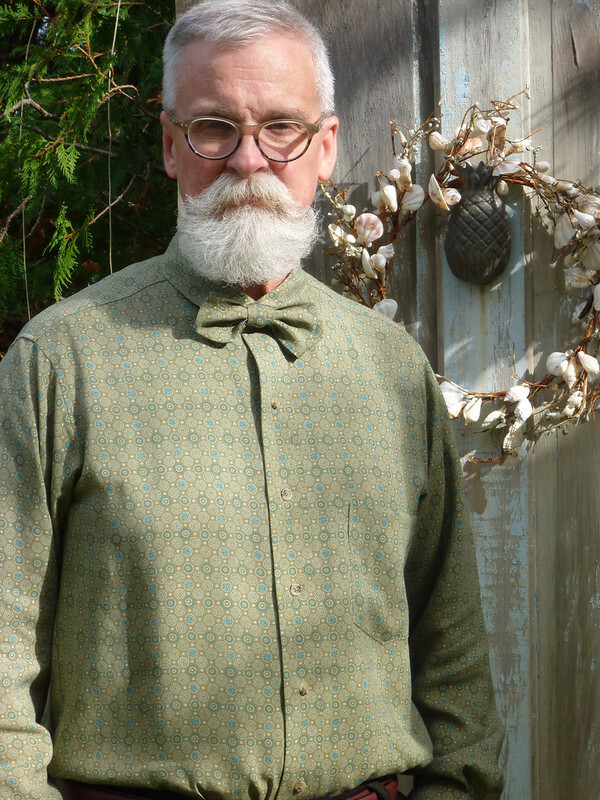 I own some real bow ties, so I used them as a guide for the overall size. One of my favorites has pointed ends, so I tried to replicate that look. Essentially, I just made it up as I worked along. No rocket science required! 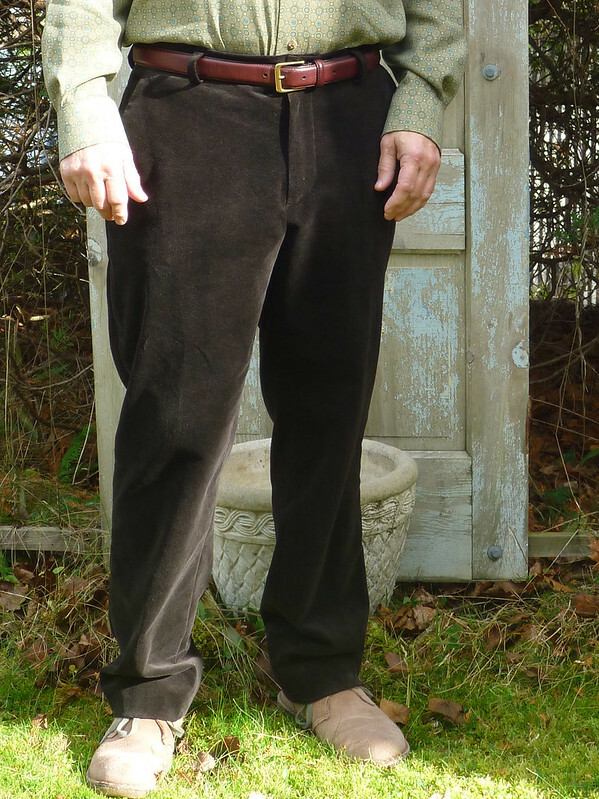 I've also banged out a pair of velvet Jeds. Sadly, the fabric here isn't really anything to write home about. It's been in my stash for a long time. It was a bargain fabric purchased online from Denver Fabrics. I might have paid $6 a yard for it, and, to tell the truth, it looks it. There's no way to sugar coat it, it's cheap fabric. Certainly nothing like the velvet I picked up at Britex last year. But, then again, that fabric was originally something like $75 a yard! If there's one positive thing I can say about cheap stretch velvet, it's easy to work with. No velvet pin boards required for this stuff. I was able to press this stuff with reckless abandon! 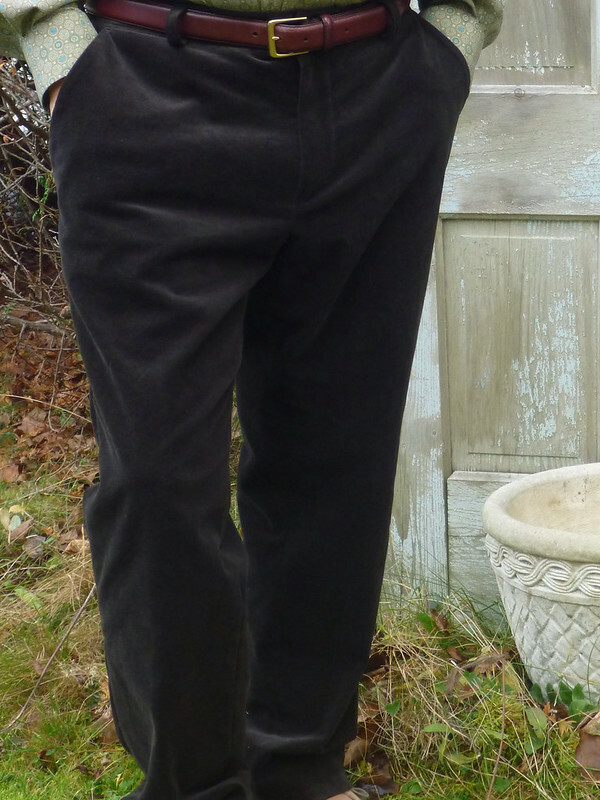 So these may not be the velvet pants of my dreams, but they're serviceable and easy to care for. So I plan to just wear the hell out of them this fall and winter. I think the pocketing fabric might be nicer than the pants fabric! This is the fourth pair of Jeds that I've made. I never tire of the way they finish up. 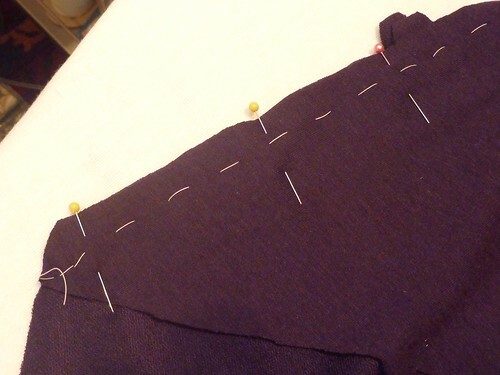 Using the tutorial on the Thread Theory website, I redrafted the back and made welt pockets instead of patch pockets. It's surprisingly easy to do, and makes for a slightly dressier look. My next project will be a little more complex and involve uncharted territory for me..... Namely, knits!